On Friday, April 29, Twisted Sister performed at the Best Buy Theater in New York City to benefit The Pinkburst Project. Check out video footage of the concert below. Created by Twisted Sister guitarist Jay Jay French, The Pinkburst Project is a collection of custom made guitars and amplifiers that have been built to both create awareness for The Ocular Immunology and Uveitis Foundation and be sold at auction to help raise funds for research, education and support for those affected by uveitis and other inflammatory eye diseases. Uveitis is the leading cause of blindness among American girls. According to BirminghamMail.net, legendary Black Sabbath guitaristTony Iommi is among the musicians who joined former Black Sabbath/ELO drummer Bev Bevan on stage this past Thursday night (April 28) at Birmingham, England's Gatecrasher club. Bevan was the 22nd celebrity honored on the Broad Street Walk Of Stars in Birmingham, England. Tony Iommi, comedian Jasper Carrott, guitarist Trevor Burton and rock and roller Raymond Froggatt were on stage at the Broad Street club, following the presentation. The all-star lineup played a "hit-packed" set featuring songs from Bev's career such as Move rockers "Fire Brigade", "Flowers In The Rain" and"California Man". They also belted out a host of classics like "Summertime Blues" and "Go Now", the chart-topping ballad by Birmingham band The Moody Blues. Video footage of the performance can be viewed below. Some 10 years ago I purchased the domain name GuitarTV.com with a vision to one day launch an interactive 24-hour online video channel streaming performances of the world’s greatest guitar players in multiple genres, live concerts, guitar-related movies, and more. On May 10th we’re launching GuitarTV.com with a live event from Musicians Institute in Hollywood. You could win an Ibanez JEM by RSVPing here and joining us online for the launch. Get early site access by registering at GuitarTV.com. Peace." VH1 documentary on the release of 1975 KISS Alive, and it’s affect on the music industry. At the time, double live albums were unheard of, especially by a band with no radio hits at the time. 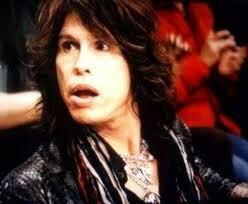 Steven Tyler: "To snort or not to snort. That wasn't even a question." Like that night in 1978 when he blacked out on stage while singing "Reefer-Headed Woman." Or when he and Aerosmith visited the White House on the day President Bill Clinton was impeached. Or that weird weekend with Keith Richards at Bing Crosby's old house on Long Island. Everyone, Tyler writes, "was gacked to the nines on coke." The Associated Press purchased a copy on Thursday of "Does the Noise in My Head Bother You? ", scheduled for release next week. Explicit and filled with expletives, it reads like an even wilder and louder version of Richards' best-selling "Life." Tyler, 63, settles back and tells story after story about life in the "most decadent, lecherous, sexiest, nastiest band in the land." Or as Tyler states it: "To snort or not to snort. That wasn't even a question." The road was so crazy that Tyler can't remember how many times he was arrested. He recalls visiting Paul and Linda McCartney backstage with Bebe Buell, the mother of Tyler's daughter, Liv. Buell and Linda McCartney do not hit it off. Buell calls her "Sluggo." McCartney answers "Sluggett." They wrestle to the floor. But the men are cool. "I like your music, man," Paul says. A native of Yonkers, N.Y., Tyler was born Steve Victor Tallarico in 1948. He remembers hearing Elvis Presley as a little kid, and feeling like he was "bitten by a radioactive spider." By age 15, he knew he wanted to be a rock star and he knew he liked to get high, mastering the art of rigging his bedroom door so he wouldn't get caught smoking pot. At age 16, lightning hits — someone tells him he looks just like that rubber-lipped singer from the Rolling Stones, Mick Jagger. By the late 1960s, he has met the other members of Aerosmith and hung out with them at Woodstock. They get their first record deal in 1972. Their self-titled debut album comes out the following year. The band's name was suggested by drummer Joey Kramer. They had considered Stit Jane, or the Hookers (Tyler's idea). Kramer mentioned "Arrowsmith." Like the novel by Sinclair Lewis? No, Aerosmith, a-e-r-o. Perfect, "The name evoked space — aerodynamics, supersonic thrust, Mach II, the sound barrier." Tyler describes working on such classics as "Dream On," written at a Hilton Hotel near the airport in Boston and a touchstone for his own life, with its warning that "Maybe tomorrow the good Lord will take you away." Another favorite, "Sweet Emotion," was inspired by his "anger and jealousy" over guitarist Joe Perry's moving out to live with his girlfriend. "Walk This Way" was partially inspired by Mel Brooks' horror spoof "Young Frankenstein" and the famous line uttered by Marty Feldman. The band cracked up and a song was born. He's a born bragger, but he's willing to kick himself, too. Tyler is open about his battles with Perry, a bond "fraught to say the least." They are "soul mates" who might not speak for months, brothers caught up in "moments of ecstasy and periods of pure rage." But that's OK with Tyler, who reasons that all rock stars are egomaniacs and that you wouldn't want to be stuck with "clones of yourself." Sober now, Tyler has been in rehab often enough that he lists the treatment facilities, eight of them, from Hazelden to the Betty Ford center. Drugs were bad for his health, his spirit, his wallet. "I snorted my Porsche, I snorted my plane," he confesses. He cleaned up a few years ago but relapsed after the death of his beloved mother, Susie, in 2008. He gives a "moment-by-moment" recap of the summer night in 2009 when he fell off a stage in South Dakota. ("I zigged when I should have zagged.") His band mates didn't call him for 27 weeks and looked for a new singer. "I got chastised for falling off the stage high," he remarks. He writes briefly about joining "American Idol." He was touring in France in June 2010 when he got a text from "Idol" judge Kara DioGuardi wondering if he wanted to give the show a try. "Like a dummy," Tyler recalls, he asked only how high were the ratings. Very high. His inner voice tells him, "Yeah, I'll do it." Tyler signed on before telling the band. He remembers Perry barging into his dressing room, furious that he learned about it from the press. But that's all "water under the bridge," Tyler says. The tour was "beyond successful" and if he bombs on "Idol" he still has a day job, "And, boy, what a day job I got!" 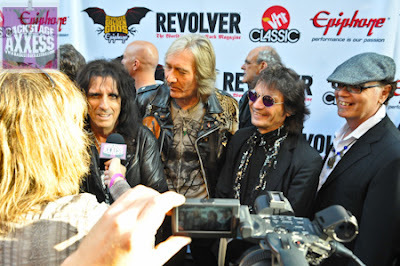 David "Gus" Griesinger of BackstageAxxess.com conducted an interview with members of the original Alice Cooper band on the "black carpet" of the third annual Revolver Golden Gods Awards, which was held on April 20 at Club Nokia in Los Angeles, California. You can now watch the chat below. Shock-rock godfather Alice Cooper received the "Golden God Award" - which is given to one special honoree a year who embodies the spirit of hard rock and metal - at this year's Revolver Golden Gods Awards. Whitesnake will kick of their tour on May 11th in Westbury, NY, USA. The new album "Forevermore" entered the top 50 spots in several countries. And the much anticipated "Live At Donington 1990" DVD are soon to be released. This is a great spring for Whitesnake fans! David Coverdale stopped by the Revolver Golden Gods Awards in LA earlier this month, both to participate and for a little chat with the Metal Injection website. You can now watch the chat below. "Mirrorball" will include a 50-minute DVD that contains live performances and intimate backstage footage of the band captured on the road. A special limited vinyl edition will also be made available. "Mirrorball" will also be available online, marking the first time the band's music will officially be made available for digital purchase. Def Leppard will also be releasing their new community based website in May, which is being developed to be the ultimate Def Leppard fan experience and go-to destination for all things on the band. 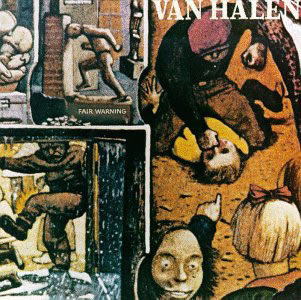 Van Halen: 30 Years Since The Release Of "Fair Warning"
On April 29th, 1981, Van Halen unleashed their darkest album. From the opening out-of-this-world sounds of “Mean Street” to the insane fade out of “One Foot Out the Door” this album is nothing short of a masterpiece. Although it’s the worst selling album ever made with Dave or Sammy (though it did go double platinum), it’s always been one of the favorite albums of many fans. It’s one of those few albums that can still give you goose bumps the thousandth time you hear it. Much of this album was written in the early morning hours when Ed and Donn Landee would retreat to the studio after the rest of the band had gone home. This practice signaled a turning point in Van Halen’s career, Edward was becoming increasingly frustrated about not being able to express himself the way he wanted to; he felt he was growing musically but was being suppressed by Ted Templeman and Roth. Tensions between the guitarist and the vocalist increased, and Edward briefly considered quitting the band. Alex convinced him to stick it out, and "Fair Warning" was the result. However, the anger and unhappiness comes through in the music, giving the album its dark undertones. The "Fair Warning" sessions were also the seed for Edward’s desire to have his own studio, and in fewer than three years, 5150 Studio became a reality in his own backyard. Fair Warning was one of the first albums to reflect the rift in the Van Halen power structure; David Lee Roth wished to emphasize the pop influence that emerged on the previous two albums (which brought the band increased attention and a wider appeal), while guitarist Eddie Van Halen preferred to explore darker, longer and generally more complex song-structures that emphasized his innovative guitar work. 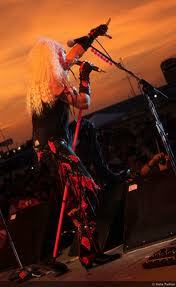 Edward clearly prevailed, as the album in fact featured longer, darker, more aggressive guitar-oriented material. Fair Warning also ushered in the first appearance of synthesized keyboards on a Van Halen record, played by Edward. Despite the synthesizers, Fair Warning contained no radio hits (although "So This Is Love?" charted briefly) and included one instrumental, the synth-heavy "Sunday Afternoon in the Park". Argentinian web site Vorterix.com conducted an interview with vocalist Bruce Dickinson of British heavy metal legends Iron Maiden when the band performed in Buenos Aires on April 8, 2011. You can now watch the chat in two parts below. 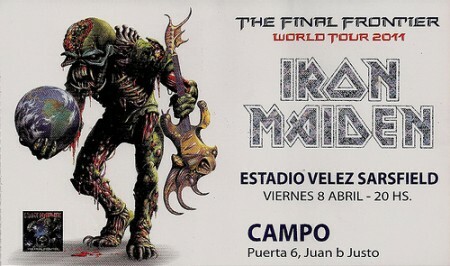 Iron Maiden's April 8 and April 10 concerts in Buenos Aires, Argentina and Santiago, Chile, respectively, were professionally filmed and recorded for a future DVD release. Last week Ozzy Osbourne stopped by the Rolling Stone offices to discuss his new album "Scream", his forthcoming world tour, the death of Ronnie James Dio and the possibility of a Black Sabbath reunion (see video below). 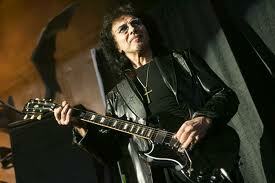 "I love those guys - Bill, Tony and Geezer," he told Rolling Stone about a possible return to Sabbath. "I never say never anymore because you never know what's going to come around." "I'm willing," Osbourne added. "But there are three other guys as well. It goes backwards and forwards. One day this, one day that. I'm up for it. But we'll see. If it's meant to happen, it'll happen." 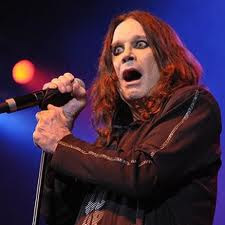 Osbourne did admit that the prospect of the reunion is a little daunting. "The pressure of doing a new Black Sabbath album is enormous, and for it to be as good as what we did back then," he said. "It's been 30 years since we actually sat down and tried to write together, and we've all changed so much. I know I have." 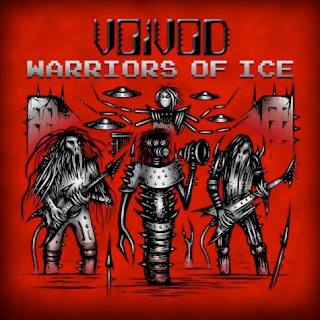 Canadian metal innovators Voivod will release a new live album, "Warriors Of Ice", on June 17 via Indica Records. The CD was recorded on December 12, 2009 during the band's first headlining show in Montreal, Quebec, Canada in ten years. 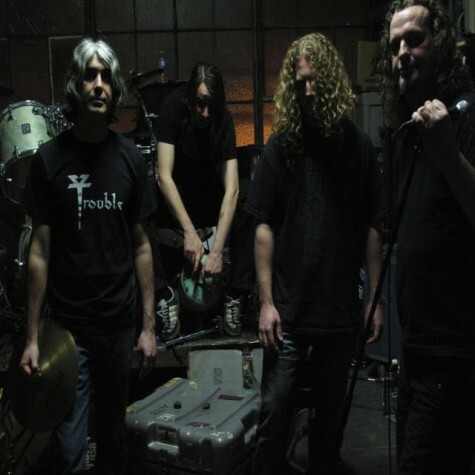 This unique band, which over the years has been able to create its own sound and path and braved adversity and hardships - notably the death of guitarist Denis "Piggy" D'Amour in 2005 - is offering its fans its first-ever live record to feature original members Denis "Snake" Belanger (vocals), Michel "Away" Langevin (drums) and Jean Yves "Blacky" Theriault (bass), alongside new guitar player Daniel Mongrain, thus adding onto their impressive discography that spans close to three decades. 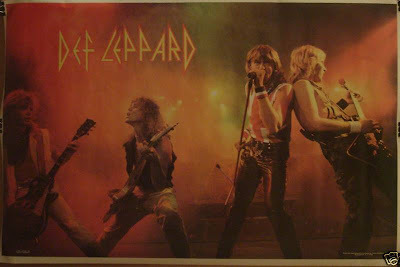 Back in 1983 Def Leppard did this amazing gig at Rockpalast Metal Festival. 28 minutes of pure Leppard, this is someting to watch while you wait for "Mirrorball". Def Leppard's debut album, "On Through The Night", was released in 1980. 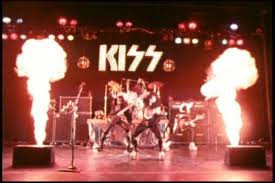 Although the album hit the Top 15 in the UK, many early fans were turned off by the perception that the band was trying too hard to appeal to American audiences by recording songs like "Hello America" and touring more in the US (supporting AC/DC and Ted Nugent). The band had by then caught the attention of AC/DC producer Robert "Mutt" Lange, who agreed to work on their second album, "High and Dry"released in 1981. Lange's meticulous approach in the studio helped them begin to define their sound. Phil Collen, former guitarist with the glam band Girl, replaced Pete Willis, who was fired on 11 July 1982, due to excessive alcohol consumption on the job. This personnel change took place during the recording of their third album, "Pyromania", which was released early 1983 and also produced by Lange. The lead single, "Photograph", turned Def Leppard into a household name. 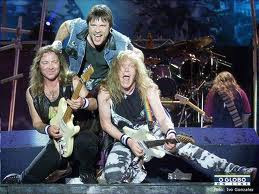 A souvenir from the 2001 Rock in Rio festival, this set proves that Iron Maiden not only are among the elite heavy-metal purveyors of all time but can still shred onstage with the best of them. The British sextet holds its audience of a quarter-million in thrall for two hours, opening with a pummeling "Wicker Man" and wending its way through nearly three decades of hard-rocking tales of the mythic and supernatural: "The Mercenary," "The Trooper," "The Evil That Men Do," "The Number of the Beast," and ending with the ubiquitous "Run for the Hills." Concert footage was edited by bassist Steve Harris; obviously attuned to his band's rhythms, he ensures the visuals are as in-your-face as the music. In March 28, 2011, Jason Saulnier of the MusicLegends.ca web site conducted an interview with guitarist Kaleb Duck of Canadian hard rock veterans Helix. You can now listen to the chat in the YouTube clip below. 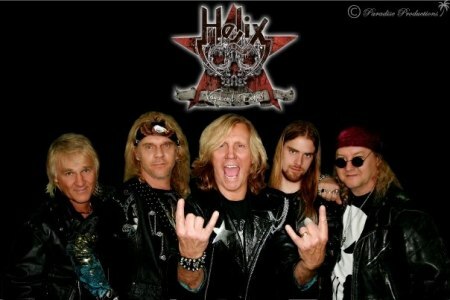 Helix's acoustic album, "Smash Hits Unplugged", was released in January. The effort was recorded at A Studios in London, Ontario with co-producer Aaron Murray and is comprised of "all our hits plus the James Leroy song 'A Touch of Magic' which I've always wanted to record," stated singer Brian Vollmer. 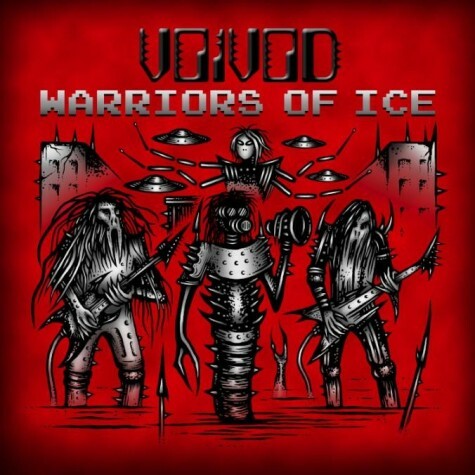 The artwork for the CD was executed by Matt Brooks of Babyjack Design, who also designed the cover for the last Helix album, "Vagabond Bones". Helix is preparing to enter A Studios to record three new tracks: "Champagne Communist", "When The Bad News Blues Come Calling" and "Angelina". The band is also toying with the idea of recording its acoustic show at the Aeolian Hall in London, Ontario, Canada on Wednesday, May 11. 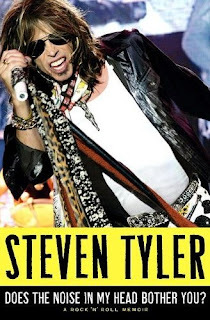 An excerpt of Aerosmith frontman and "American Idol" judge Steven Tyler's new autobiography, "Does The Noise In My Head Bother You? ", can be found at Today.MSNBC.MSN.com. If you’re a hammer, everything looks like a nail. If you’re a singer, everything looks like a song. “Life is short. Break the rules, forgive quickly, kiss slowly, love truly, laugh uncontrollably, and never regret anything that makes you smile.” We’re not quantified; there’s no chart of desire. When the roaring flames of your heart have burned down to embers, may you find that you have married your best friend. Hunch, conjecture, instinct…a blind allegiance to anything can get you killed, and always remember…sing as though no one can hear you; live as though heaven is here on Earth. Here I want to say something deep and meaningless, like “To thine own self be true,” but in truth, the first thing we have to do is KILL ALL THE LAWYERS. "Does The Noise In My Head Bother You?" is scheduled for release on May 3 as a 400-page hardcover.